While metro surfers consider their antics to be the ultimate extreme experience, authorities claim those who practice the “sport” are literally inches away from death every time they jump on to a metro. The Moscow subway tunnels are extremely narrow, especially near stations, as they weren’t designed to have anything but the trains passing through them, and even a cat would have trouble fitting in the space between train and concrete. But the danger of broken limbs and even death doesn’t seem to be scaring away daredevils who seem hell-bent on ending up in an early grave. Some of them have taken the surfing part literally and began climbing on the train to actually ride it, which is even more dangerous. Viktor Vartanyan and Ivan Mikirtumov, two 19-year-old university students recently died metro surfing and evidence indicates they both smashed into a low tunnel entrance while metro surfing. 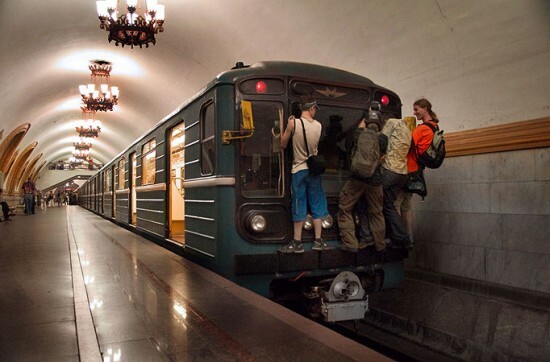 The fine for being caught metro surfing is only 100 Russian rubles ($3.5), and Moscow metro surfers consider it worth the risk, for a chance at Internet stardom. They’re aware of the dangers as well, but most of them think it’s so fun the risks are justified.